Nine members of Okehampton Running Club ran the Torbay Half Marathon on Sunday. When the day arrived the sea looked very tempting! The actual race course was a traffic free two lap route which started and finished on Paignton seafront, taking in the stunning coastal views across Torbay. The weather was very hot but still some excellent times were achieved on the undulating course. Hugh Robinson with a brilliant run of 1:26:38, achieving a club diamond award, Hayden Bond 1:30:30, which was a big PB, Jackie Dawes 1:51:49, Liam Keen 2:17:45, Paul Evison 2:05:02, Cameron Whitelaw 2:16:26, Ed Dumpleton 1:36:42, Mike Westland 2:08:02, and Gaz Williams 2:06:02. Considering the heat, these times were a massive effort. 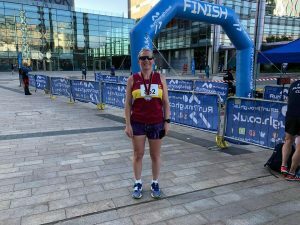 Okehampton Running Club lady, Jo Page continues to find out local races wherever she is working and this week she competed in the Run MediaCity 10k held near the Manchester area. The course is a multi lap race taking runners past the BBC and ITV television studios. This is a midweek race which Jo completed in a new PB of 44:24, and she was 2nd female over all. Jo completed her week competing in Saturdays Exeter Inflatable race which is a fun packed race combining a variety of inflatable obstacles, no PB here but a whole bunch of fun. 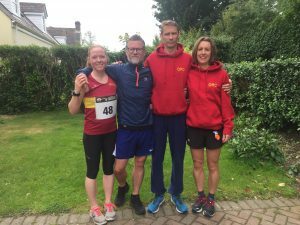 The 2018 Father’s Day Half Marathon in Guernsey saw 3 Okehampton Running Club members take on the Half Marathon. The race started towards south west corner of the island in the L’Eree area. The runners follow the main coastal road north before turning east across the top of the island then south to finish in the main town of St Peter Port with the finish on the Crown Pier in Town. As in 2017, all competitors will be given a free half-litre of low-fat Guernsey milk when they cross the finishing line, as well as a medal and souvenir technical running vest or t-shirt. Jean-Paul Quertier came in first of the ORCs in 1:36:47 followed by Jason Ewing 1:40:50, Keri Quertier ran in with a new PB of 1:44:42 (PB by nearly 3 minutes). Keri was accompanied by former ORC Rebecca Ewing in an impressive 1:44:42. Many thanks to Mags and Robert for preparing the report whilst Jane is on holiday. Andrew Vernon completed the Burrator Horseshoe Run. A 7 mile moorland run from Meavy and out over Dartmoor. The Burrator Horseshoe is a scenic, challenging moorland run, starting and finishing at Meavy Village Green. It is a part of the Meavy Oak Fair, a traditional village green fair held annually. Andrew finished in a very good (Unofficial) time of 48:30. 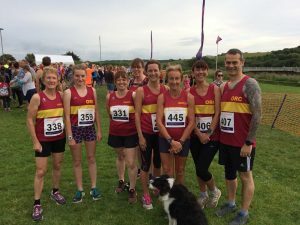 Last Wednesday evening saw the 10th Anniversary of the hugely popular Bude Lifeboat Run, and to mark the occasion each runner received a commemorative T shirt in addition to the usual finishers’ medal. The 6 mile course changed last year to avoid congestion in the early stages and is slightly shorter now but with an extra hill in it. we had a smaller turnout here than usual with several would-be runners missing out when entries filled up so quickly, but those who took part put up some great performances. First home for the club in a great time of 46.26 was young Issy Edworthy, now out of the junior races here and running her first race over 5k. Close behind was Karen Vallance running really well despite not having raced for some time and finishing in a very good 46.43 to come 2nd FV45. The next two runners’ home had both completed the tough Tsunami marathon four days before, but Jo Turner found good speed in her legs still to finish in 47.16 with Jane Jackson coming home in 50.25 to take 1st FV60, while Mags Jarvis was third in the same category with her time of 51.45. Fast improving Phil Turner was the only male representing ORC and did extremely well to knock 6 mins off his course PB, finishing in 52.31. Katy Speak and Carole Cornwall had both run the 16mile Tsunami and much appreciated the lack of huge hills and fewer miles here to finish in 58.15 and 58.18 respectively. 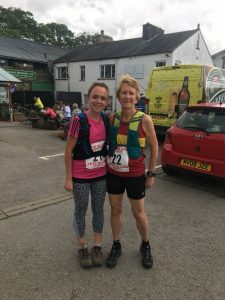 Mags Jarvis ran the Brunt Knott fell race in the Lake District, which was her third race in 9 days. A 5.6 mile with a 410m climb to the summit in a time of 1:12. The conditions were good for running being cloudy and mainly dry under foot. There were some excellent views of the Kentmere Valley and beyond. 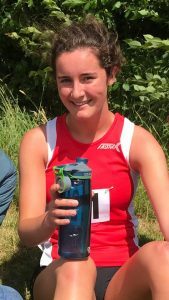 And finally, an exciting talent from the Club is Eleanor Marvin, one of our junior members, who was selected to run the 1500m for Devon at the South West School’s Track and Field Championships. She had a really good run against extremely fierce competition. Her time of 5:26 was just outside her pb but good for the very windy conditions. Team effort this week in the production of this report, Jane Jackson, Mags Jarvis and Robert Richards. Last weekend was all about endurance with seven runners taking on the incredibly tough Tsunami races organised by PureTrail where the options were a 36mile Ultra, a marathon and a 16miler using the most rugged, wild and remote sections of the Southwest coast path between Westward Ho! and Bude. The name Tsunami referred to the effect the race was meant to have, with each distance starting at two hour intervals there was a tsunami-like effect, gathering more runners the further down the course they went. On an incredibly hot and humid day, the scenery was stunning and was the only compensation for the massive effort involved, the Ladies won the day. Robert Richards was the only Okehampton runner in the Ultra marathon that started in Westward Ho! but he had to retire at Hartland Quay feeling unwell after completing a tough 21 miles. 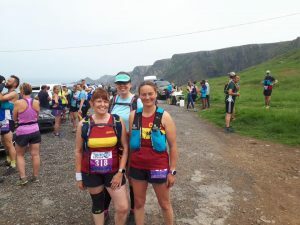 The marathon saw Jane Jackson, Christine Fritsch and Jo Turner, take on what has been acknowledged as the toughest marathon in the south west, with over 5,600ft of ascent and the relentless, steep up and down being at its worst in the last 10 brutal miles. Starting in Clovelly harbour the first task was to climb up the steep, cobbled streets to join the coast path at the top. From here to Hartland Point was a mixture of woods and fields with a few stiff climbs and sets of steps on the coast between there and Hartland Quay. Running together they made the 1.00pm cut-off point here easily although Christine was already suffering the effects of the horribly humid heat, even considering pulling out, but a cool down in a stream thankfully revived her, a practice they continued to use at every stream crossing. From there on the unrelenting hills and difficult terrain restricted the running to short stretches between tricky downhills and the next climb, finishing with a half mile through the town to the finish at Bude Castle. All three were using the race as training for upcoming ultras so were not aiming for a fast time, just completion, which they achieved in 7.55.28. 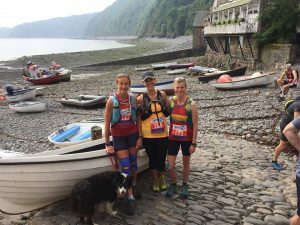 Three more runners ran the 16miler, which although less distance, was by no means an easy run, taking in the toughest section of the coast path and having over 3,200ft of ascent. Gill Spinney was first home for the club, running strongly over ground she had trained on for the race and coming home in 3.52.44. Carole Cornwall and Katy Speak ran together and, despite being no strangers to tough off-road races, found it hard and very uncomfortable in the heat. They completed in 5.38.11, deciding they would not want to do this one again, despite the glorious scenery. Just as this race was nearing its conclusion, four more runners were about to set off on theirs. Tempted by the draw of a visit to a National Trust property and cream tea at Coleton Fishacre. 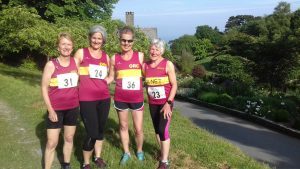 Janet White, Ruth Bushell, Kathryn Volkelt-Igoe and Mags Jarvis visited the house and beautiful grounds then took part in the Coleton Footache race of just over 6 miles. The route took in about 3 miles of the coast path south of Brixham and they were rewarded, by stunning sea and coastal views. After reaching the World War Two gun batteries at Forward Point they climbed about 100m heading inland. The sting in the tail was another drop back down through the fields and final climb back up through the gardens to the finish. Even though the race was in the evening the conditions were still very warm. Mags was first to finish in 1:16:50 and won the prize for the 1st W60-64. Ruth and Kathryn ran most of the race together and finished in the time of 1:26:27 and Janet completed the course in 1:29:01. 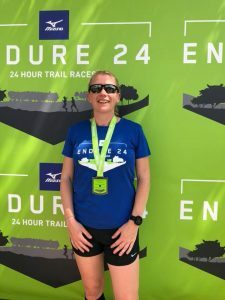 Endurance was all that mattered in a challenge completely new to any ORC, taken on by Jo Page this weekend when she took part in Endure 24, where, as part of a team of four, she ran a 24hour endurance race. Set in the scenic Wasing Park Estate, Aldermaston, it was a relay race over an 8k loop to be completed as many times as they could, starting at midday Saturday and finishing midday Sunday. Already becoming renowned for her ability to race every week, Jo had no idea exactly what she was letting herself in for when she agreed to replace someone who had dropped out of the team, but with her positive attitude of trying anything out she thoroughly enjoyed the challenge of repeatedly running the same loop with only about 2hrs break in between her runs. Jo, being the fittest in her team did some double laps to make up for the slower runners and by the end had run an incredible 50miles, with their team completing 135miles in total. 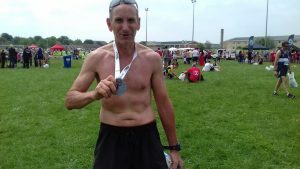 Roger Voaden continued to make his way towards joining the 100 Marathon Club when he ran the Yeovil Marathon on Sunday. Just a week after running the Dartmoor Discovery, Roger enjoyed the somewhat less hilly route of this two lap race which starts and finishes on the athletics track at RNAS Yeovilton and follows country lanes around the town. Roger had a good run, finishing in 3hrs 12min. At the other end of the distance scale, but equally a big achievement, new member Louise Jane completed her first ever race. Louise only started doing some running at the start of the year and then joined the club to give her the impetus to carry on. 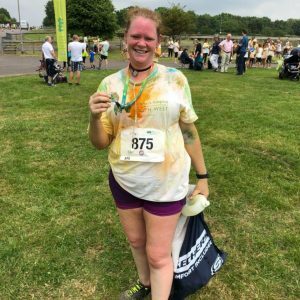 Helped by the support of the club and her training runs, she completed the Rainbow Run in Exeter in 35.20 and now looks forward to improving her time and fitness. 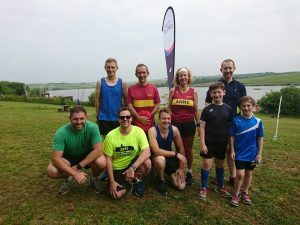 There was a good turnout of ORCs at the weekly park run at the Tamar Lakes where some good times were posted by all, while some great runs were scored at the Run Exe 5k earlier in the week. Here four ORCs took part, with Jo Page (21.32), Jo Bradford (23.33) and Lotte Smith (28.34) all running PBs. Andy Vernon also ran a good time of 18.52 although not a PB. The club held the first of its annual one mile time trials last week where Jo Bradford (6.27), Jackie Dawes (6.37), Jo Page (6.07), Gaz Williams (6.28), Jo Burrow (7.22) and Cam Whitelaw (7.29) all set new PBs, while Jane Jackson (6.44) and Mags Jarvis (7.04) gained their platinum awards for the distance, Jane setting a new club highest age graded percentage for ladies of 87.1%. Last Saturday saw the 20th Anniversary of the longest single lap road ultra marathon in the country, the Dartmoor Discovery. To mark this milestone in the race’s history the usual 32 mile course was changed to 34 miles, the distance of the original race. This didn’t deter four of our intrepid runners from taking on the challenge. Paul Carter, Robert Kelly and Roger Voaden were already Discovery veterans but this was not only the first Discovery, but a first ultra of any kind for Andy Vallance. Starting in Postbridge the course takes the runners through Dartmeet, Poundsgate, Widecombe in the Moor and Postbridge before making its way back to Princetown. On a clear sunny day the countryside was beautiful but the hills are steep and relentless. This is Robert Kelly’s favourite race and ever since he ran his first one four years ago he has got progressively faster over the course. This year he was first ORC home in a very impressive time of 4.32.32, just one minute slower than last year’s time over the shorter course and finishing in 6th place overall. Stepping up to a longer distance was no trouble for Andy Vallance who, despite not having a great preparation for the race, was the next home for the club in 4.54.31 to come 12th overall. Paul Carter had another good race here, finishing in 5.00.59 to take the 2nd MV50 prize and Roger Voaden finished in 5.17.05. Okehampton was the first club to have three members home, but due to the format of how the places are calculated Rob, Andy and Paul in fact took the second team prize. 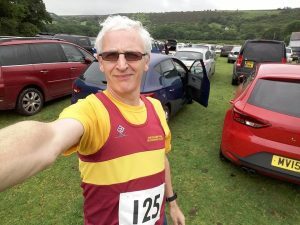 Okehampton runners are always looking to take on new challenges , Paul Crease, certainly did that on Saturday when he and Paul Bradford, husband of Jo Bradford, tackled the Welsh 1,000s Race. 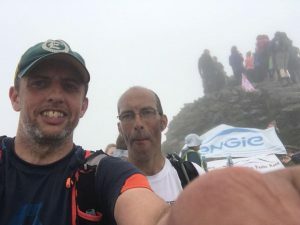 Running in the pairs Long Challenge Race they ran the five peaks of Snowdonia over 1,000 metres, finishing on the summit of Snowdon. Starting at sea level the first two miles are relatively flat before the serious climbing starts with a massive five mile climb to the first summit at 3,400ft. Paul is no stranger to running hills but this challenge was huge, with over 9,000ft of gruelling ascent across the 20 mile route. Although marshalled navigational skills are needed as well as strength and endurance. Their task was made harder in the last two miles due to the congestion caused by large numbers of tourists on the path. They finished together in an incredible 6.12.47 to come home second pair and then faced another 4.5 mile jog back to the race HQ! There was some controversy at the Burrator 10k on Sunday. 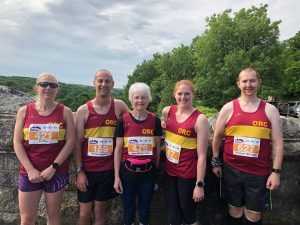 Here Okehampton had five runners taking part in this popular race, held in a stunningly beautiful setting, where the fast flat course does one and 2/3rds loops of the reservoir. The start and finish were moved back last year to avoid congestion in the early stages and the course has an England Athletics certificate of measurement. However this year all the runners recorded their distance as 6.4 miles instead of 6.2. and following a race organisers enquiry the decision has been taken to get the course re-measured. Despite this there were some good times recorded by the ORCs taking part. First home was Ed Dumpleton, finishing in 43.09, followed by Jo Page in 46.52. Emma Dean ran a very impressive race, third in her aged category and taking four minutes off her PB despite the extra distance, to come home in 50.30. They were followed by Cam Whitelaw in 1.00.11 and Jane Richardson in 1.05.09 who was amazing coming in second for her age category. There was a slight over-distance issue at the Barnstaple parkrun too where Jane Jackson got her platinum award for 5k in a time of 24.19, but the extra distance had added approximately 24secs to her time. Error: Error validating access token: Session has expired on Saturday, 20-Apr-19 03:20:42 PDT. The current time is Monday, 22-Apr-19 11:55:24 PDT.